Modern Crowd & Metal Art Studio are looking for new artists to help expand our unique line of reproduction art. All applicants will be individually critiqued and hand-selected by our selection committee. Our call is open to any visual artist, including (but not limited to) painters, photographers, mixed media artists, digital artists, etc. If your work can be scanned, photographed, or uploaded to create a flat print file, you are invited to apply! Welcome to the family! If our committee selects your work, we will sign an Artist Agreement with you and begin by getting to know you so we can build an artist profile on our website. We will then request 25-50 high resolution, print-quality images (scans, professional photos, digital files, etc.) for your line. From there, you just sit back and let us take care of the rest! We will create the product and lifestyle images, detail specs, romance copy, and anything else needed to get the new SKUs listed with each of our partner channels. We launch a new batch at least once per quarter, so you will see your designs gradually start showing up online after only a month or two. In addition to setting up your line of giclee prints, we will give you the opportunity to include some of your originals in one or both of our partner fine art galleries. Who is in the Selection Committee? NICHOLAS YUST - professional artist collected in over 40 countries worldwide and represented in high end contemporary art galleries around the country. His clients include Fortune 500 companies, government agencies and professional athletes. ADAM SCHWOEPPE - contemporary woodworker, designer and furniture maker. His work is featured in multi-million dollar homes, upscale restaurants, and high-end facilities like private corporate booths at multiple MLB stadiums. CELESTE REITER - abstract artist and painter, specializing in color theory and urban textures. Celeste has created several of Modern Crowd's most successful designs, including the #1 best seller for both 2016 and 2017. ERIC WADDINGTON - fine art manager and artist rep with over 10 years experience selling art online, at shows, and through art galleries. Eric has sold nearly $2M in original art and another $2M in reproduction in the last 6 years alone. Professional Critique: Specific feedback from our committee as to why you were not selected. Think of us as a panel of judges on a singing competition, providing our critique after your performance. Free Unlimited Resubmissions: The submission fee will be waived for any future submissions. If we didn't choose your current selection, take our critique to heart and submit new work any time in the future for a new opportunity to be selected. Please email support@moderncrowd.com if you have any questions about these steps. Best of luck, and we look forward to reviewing your creative submissions! Eligibility Requirements - Any artist in any medium that can be reproduced as a flat print. We will gladly accept artists from any country that the United States is legally able to do business with. Submission Requirements - All designs submitted must be original work by the submitting artist and may not be a copy, replica, reproduction, or close variation of any designs from other artists found in retail stores, art galleries, publications, online, or any other source. Submission Deadline - We review all submissions quickly after the artwork is received, through the end of the current quarter. Entries can be made at any time and will be included in the current/active quarter. Selecting Artists - All design submissions will be reviewed and evaluated by our panel of judges and experienced artists. Judging criteria will be subjective based on what we believe has the most commercial appeal. Upon verification of eligibility, the artist will be contacted with the next steps. Artist Portfolio - Recognition given by Modern Crowd to the selected artsits will be the artist's name included in the product listing, their printed signature on the artwork, and potentially a signed Certificate of Authenticity (for limited edition print runs.) Our standard royalty for open edition print runs is 5% of the sale price, which will be paid monthly. 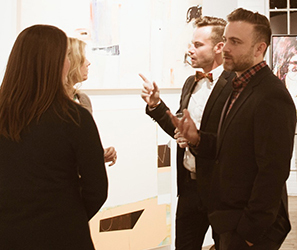 The opportunity to have artists' work viewed by retailers will depend on our annual design review with our retailers. 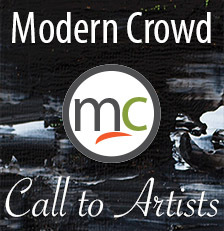 Modern Crowd, Inc and Metal Art Studio, LLC reserves the right to terminate this Call for Entries at any time without any notice. Full refunds will be issued if the Call for Entries ends prematurely without the artists' work being reviewed and critiqued. This program is void where prohibited.